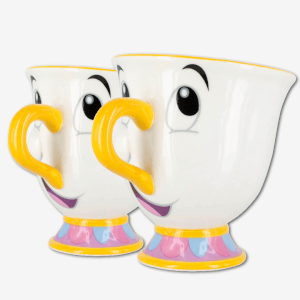 The Beauty and the Beast Chip Mug will delight all fans of the classic Disney film. Crafted from Porcelain, the highly recognisable mug porcelain mug features a charming image of the adorable character Chip, including the iconic chip from where he gets his name. An officially licensed Disney product, the mug will make a lovely addition to your Disney memorabilia and will make a thoughtful gift. It's lovely just as in the picture. My daughter in law will love it as will anyone who loves B&B. I bought two of them for Christmas, one for my mom and one for me. We used to watch Beauty and the Beast when I was a kid and Chip was her favourite character - she was so excited when she opened it! The mug itself is good quality and VERY cute. It is not too big but I knew that before I bought them so I was not surprised. Two happy customers! 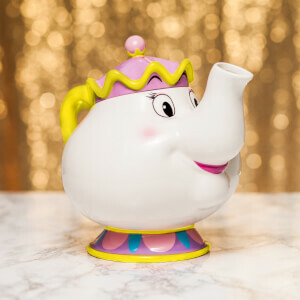 We recently bought the Beauty and the Beast teapot from Primark before Christmas. My girlfriend was a little annoyed it didn't come with a matching 'Chip' teacup. So I shopped around and this product turned out to be the best quality and price. It arrived well packaged and is such a great mug to use. It is now displayed alongside the teapot when not in use. Nice sized mug, great quality! Can be used as a mug or equally an ornament! Bought it for my friend and she absolutely loved it! Arrived packaged in a box which was helpful for wrapping and meant there was no real chips (haha) nothing negative to say! Perfect for my sister who lost her original one from Disney over a decade ago! I bought this for my daughter who loves Beauty and the Beast. She said it looks exactly like Chip does in the film. Good quality. She lives it! Great colors, very similar to the one on the movie.